A bright, blingy, absolutely adorable red-head from our foundation mare SPS Ester – a filly to make you sit up and notice! 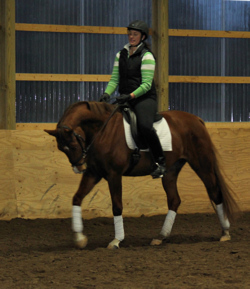 Wred Alert (aka “Allie”) is such a charming creature – and quite the athlete! People-focused, and willing to please, she is a credit to her mother, SPS Ester, and her sire, Wolkenglanz by Wolkenstein II / Bolero. Allie stayed with us till being started as a 3 year old by trainer Emily Yoemans. Emily said Allie had an exceptional backend — both powerful and quick behind. With three top notch gaits, and a willing, forward attitude it seems that Wred Alert can do it all. She will reward with her affectionate honest nature, while excelling up the levels. 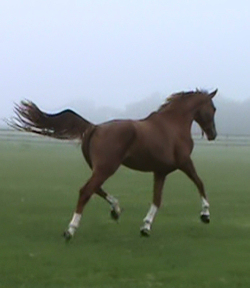 Wred Alert has been SOLD to a Grand Prix rider, and USDF Gold Medalist in California. 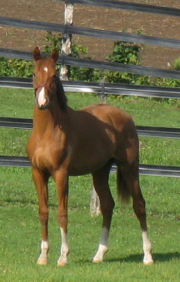 Videos show her with 5 or 6 weeks undersaddle. Pictures are at 2 and 3 years old.